End of Summer Baptism and Picnic Tomorrow, August 21st! Join us tomorrow evening for one of our favorite summer events at BCC - our end of summer baptism and picnic in the forest! 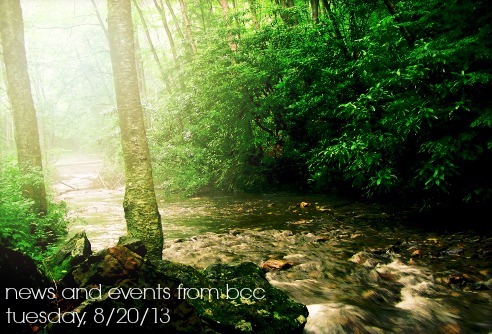 Come celebrate as we rally around believers who want to make their faith known in the river at Sycamore Flats! The picnic starts at 5 PM and the Baptism starts at 6:30. We'll provide the food; you just bring yourself! We will be shuttling to Sycamore Flats from the church! If you are interested in being baptized, it's not too late! Contact Bre at (828)884-5932 to sign up! MidWeek U Returns Next Wednesday! Join us next wednesday for our return of MidWeek University! We are offering 4 incredible classes this "semester" and we would love to have you join us for one of them! Trust me, you're not going to want to miss out on what God wants to teach you through one of these 9 week classes. Sign up or get more information this Sunday in the back of the Worship Center! Movin' Up This Sunday, August 25th! Parents! Don't forget this Sunday is Move Up day! Your child or student will move up to their new age group! We're excited for what God has in store with this new year and fresh start! Come a little early on Sunday if you have any questions about where you should go! 'Farewell Scott' Drop-In This Sunday, August 25th! Join us on Sunday as we show appreciation for all Scott has done at BCC and excitement for what God has in store for him at Compassion International! Stop by and hang out with us at a drop-in being held in the Worship Center starting at 2 PM! We'll see you there! New Adult Bible Study Starting Sunday, September 8th! What is your worldview? Is it Biblical? Does it line up with the Gospel of Jesus Christ? Join us as we explore this topic in our new 10-12 week Sunday morning bible study led by Hope Kelly and Sheila Alewine, starting September 8th at 8:15 a.m. in the Brown House. We will consider common world views, their core beliefs, origin and how they have unknowingly infiltrated our Christian culture. We will hold them up to the plumb line of the truth of the Word and discover how the Gospel answers every question in man's search for the meaning of life. Cost: $5 to cover printing costs. Email sheila@victorychurchproducts.com to reserve your study guide.